The car is a small, compact two-seater. It is easy to get into and feels spacious inside. The interior is not really basic; it feels slightly luxurious. The upholstery was a nice patterned grey colour and the dashboard and side doors were also shades of grey. The dashboard is very clean and easy to read. The GPS seems quite sophisticated and is inlaid, like a TV set. It starts up just like a normal car. There are only three speeds: neutral, drive and reverse–very simple. You don’t have to press very hard to accelerate. The car will go from 0 to 30mph in 6.5 seconds, and has an electronically limited top speed of 60 mph. Of course, there is no sound when driving since it is electric. It drives easily and responsively. We drove on a test track with lots of winding roads and a traffic-free straight away and it was a peppy, but not really speedy, ride. It has a lithium battery which is included in the cost price and should last 8 to 10 years. It also has ESP, ABS brakes two airbags and seat belt pre-tensioners, and also features a NCAP tested tridion safety cell. It is air-conditioned which is a nice, although not that necessary, plus. The 30kW electric motor is built by Zytek Automotive, a UK technology company. 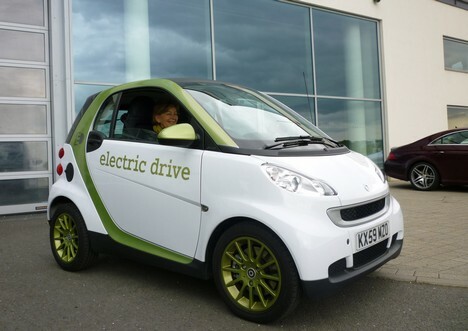 As the first step of its electric drive program, smart has been running 100 demonstration vehicles in the United Kingdom since 2007. 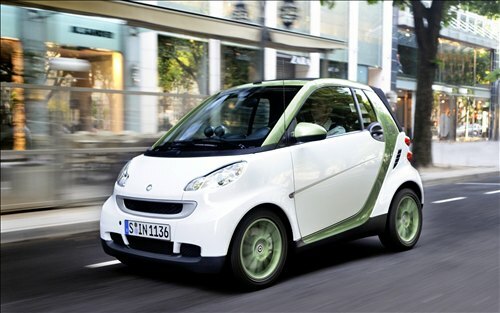 The series production of the smart fortwo electric drive has now started with 1,000 vehicles, which will be run in both Europe- starting by the end of 2009- and the United States- starting in the second half of 2010 in several cities. The series production in large numbers will start for model year 2012 vehicles, which can be bought in all smart centers. The smart fortwo electric drive will be equipped with a 16.5 kWh lithium-ion battery powering a 30 kW motor positioned over the rear drive wheels. The battery can be charged with either 100V or 220V systems and will require between 3.5 and 8 hours of charging time, depending on the voltage used and the starting state of the battery charge. An 85 mile range is anticipated. Mitsubishi Electric on Monday said it will invest about $76 million in a smart-grid project, part of a companywide push into equipment for modernizing the electricity grid. The company will create two installations–a residential-size building and a commercial facility–which will have on-site power generation through photovoltaic panels and local energy storage with rechargeable batteries. The flow of energy will be managed and optimized by power electronics and smart meters to test the performance of the equipment. Mitsubishi Electric said the projects are part of a corporatewide push to supply smart-grid technologies for the electric power industry and meet global demand for low-carbon energy. In one experiment, Mitsubishi Electric will set up a mini-power station built around a four-megawatt solar array. It will include equipment, such as switches and smart meters, to manage the flow of energy and a battery. 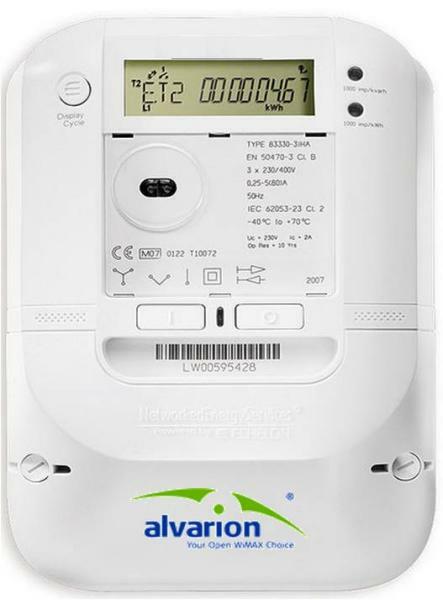 The residential-scale system will feature a 200-kilowatt photovoltaic array with a home energy-management system, which uses a smart meter and network-connected appliances. 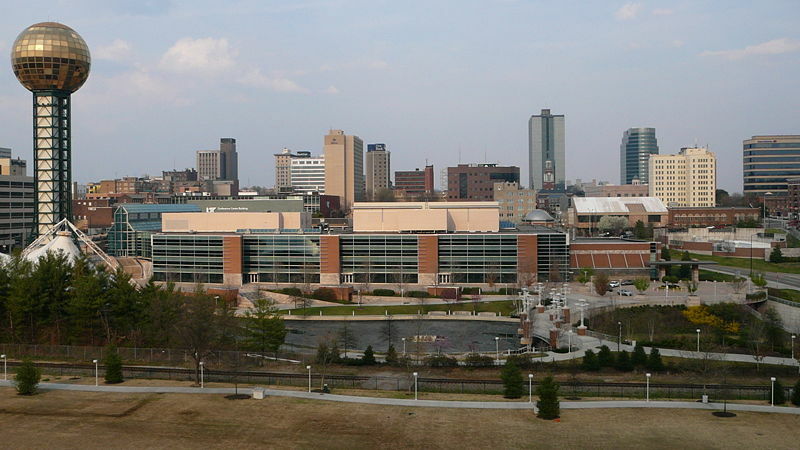 The home system recalls work being done by Panasonic in this area. The industrial giant is developing a line of energy systems for the home, including energy-efficient TVs and appliances, solar panels, batteries, fuel-cell hot water heating systems, and a home energy-management dashboard. Samsung, another company well known for its electronics, last week announced that it plans to invest $20 billionin energy and health care over the next 10 years. Meanwhile, an executive from battery supplier BYD said last month that the company plans to supply a combination of equipment, including solar panels and batteries, to homeowners. Data collected from these various research sites will be used to develop new products and architectures that could enhance the performance of existing Smart Grid technologies. Mitsubishi is placing particular emphasis on the photovoltaic segment of its business. It has identified China, India, North America and Southeast Asia as regions to target. 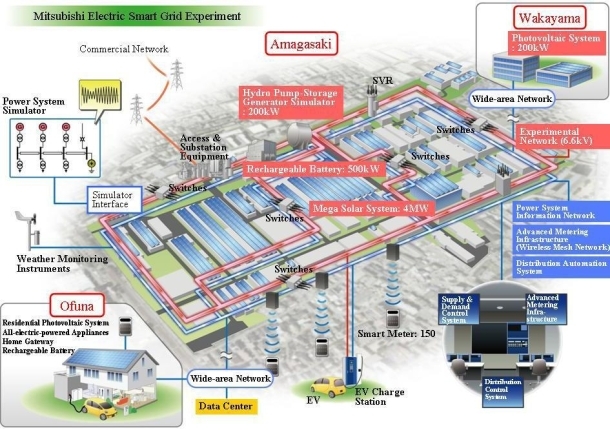 Several major Japanese corporations have taken a greater interest in the Smart Grid recently, including Toshiba (which landed a relevant partnership with SunPower in early March), Zhimizu and Kyocera. And South Korean giant Samsung also just announced that it will sink $20.6 billion into green technologies, with a special focus on solar. 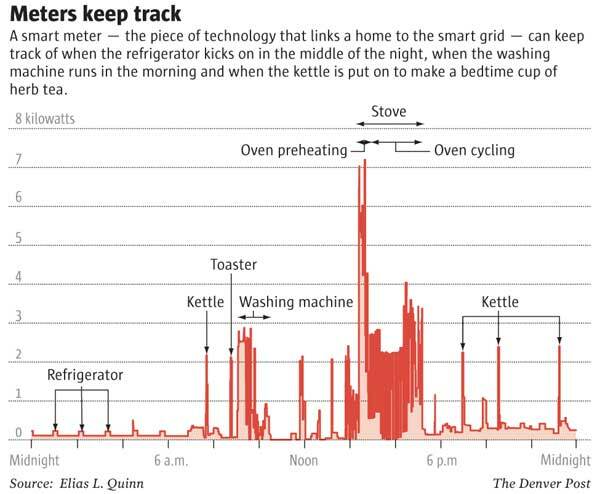 But Smart Grid efforts aren’t only heating up in Asia. At the end of last month, General Electric joined forces with Nissan to research the impact electric and plug-in hybrid vehicles may have on national electric grids — and how predicted grid overload crises may be averted. 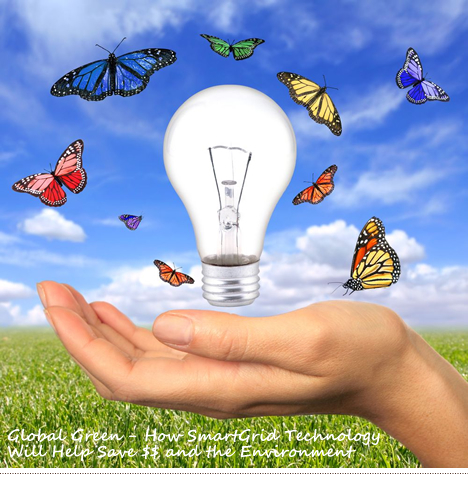 Other U.S. corporations like Cisco Systems, IBM, Intel and Microsoft have also been vocal about offering Smart Grid products to utilities and homeowners alike. However, with consumer-friendly plug-in cars like Nissan’s Leaf and General Motors’ Chevy Volt preparing to launch as early as this year, it seems like Smart Grid solutions to major challenges are needed now — not in several years. Some analysts say that less than 10 electric cars on the same block could cause power outages. If this is true, Mitsubishi, General Electric, and the rest will need to race electric vehicle market adoption to make sure the grid can handle the next generation of transportation. This sounds dicier than it should be.